After a failed attempt last year, I have been pining to return and finally see if I could complete the Ellingwood Ridge on La Plata Peak. I drove to the parking area on Highway 82 and slept in the back of my truck. Anticipating a twelve hour day I woke at 4 and left at 4:30 AM. The point where you leave the trail was fairly easy to find in dark. It is just over a hundred yards after the two log bridge crossing the second creek. I heard some animal in dark: probably just a deer, but I was hoping it wasn't a bear. It didn't start to get light until I started up the boulder field at around 7:30 am. I didn't finish the tedious climb over the boulders (pic 1) until 8:30. I missed the cairns at 39 3.38, 106 28.85 because I crossed the third creek too soon. Finally the fun part of the scramble was here (pic 2). 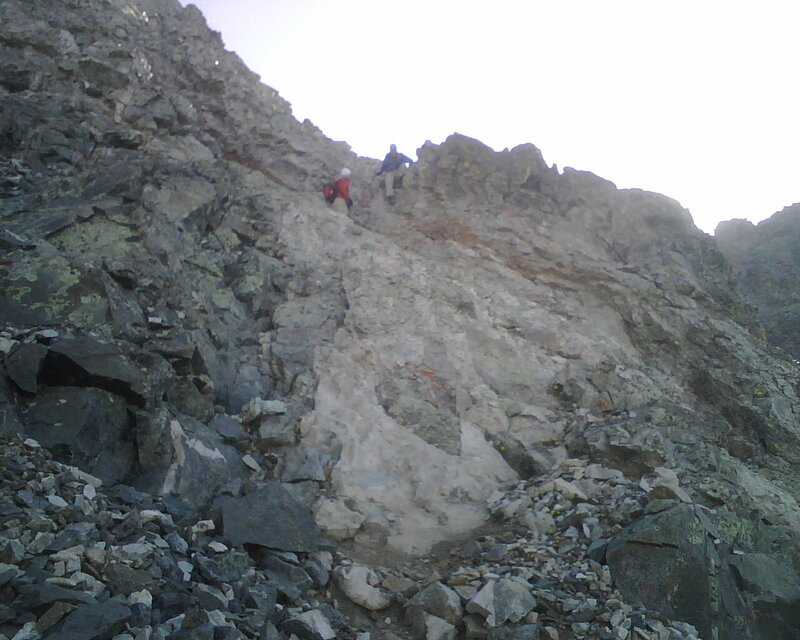 The first down climb is a good test of what is to come on the rest of the ridge (pic 3). 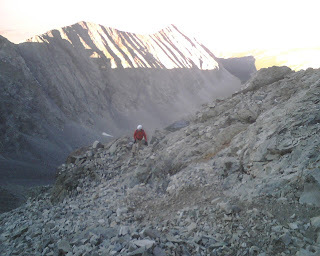 Overall the ridge is a good mix of hiking and third class climbing. I made my way contouring and down climbing on the left side of the ridge never getting too far from the ridge crest. 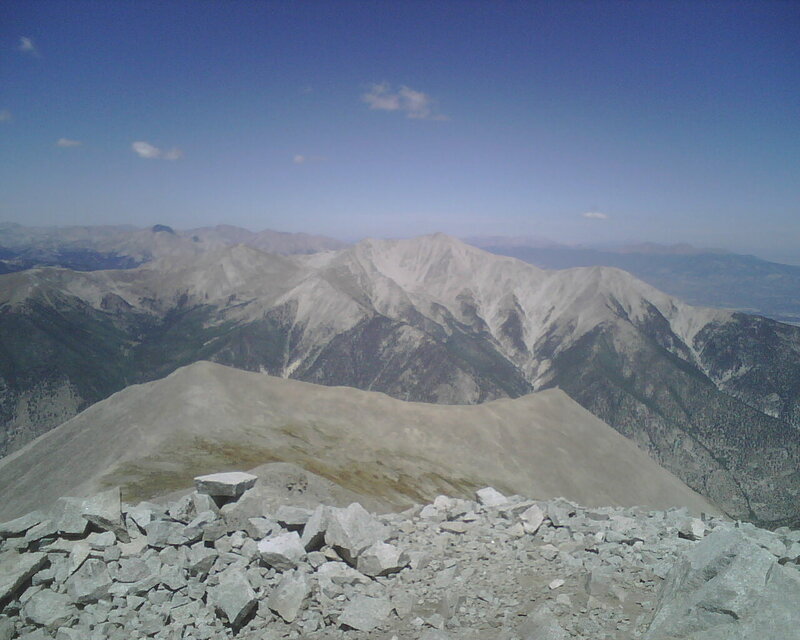 The weather looked bad toward Mt Elbert, but it was still sunny on La Plata. 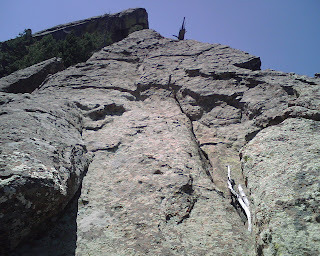 Approaching the crux of the route, I went right as prescribed, but then hooked back left. The steep terrain forced me down farther than I wanted and I missed the dihedral described by Cooper because I was too low. Trying not to lose any more elevation, I found a few dead ends but always found an escape. Reviewing my route later, I probably followed Roach's line more than Cooper's. The weather started rolling in at this point. It was snowing lightly and I could see that the summit was socked in. There was no turning back so I pressed on. Picture 4 shows one small chimney I climbed through. The best line follows the ridge crest at this point which lifted my spirits. At this point you can see the obvious route to the left of the next peak. 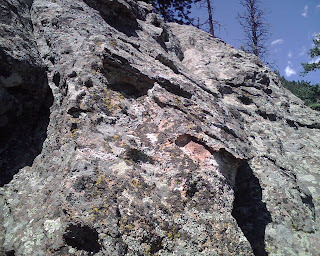 I enjoyed climbing the chock stone (pic 5), but the rock was a bit wet from the melting snow. 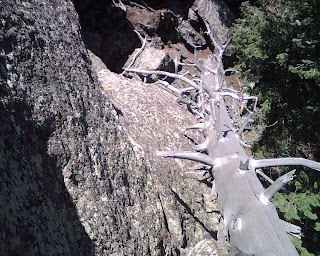 Once past this crux, I tried to make good time across the talus slope (pic 6) but my weary body could only move so fast. Pic 7 looks back on the route with the weather coming in. After passing the East La Plata summit, I was tempted to do some more scrambling along the ridge (pic 8). 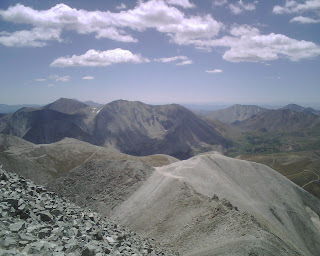 But with thunder booming to the east, I followed the advise of the guidebooks and 14ers.com and contoured left across the loose gravel then up the rocks to the true summit. Cooper's terse description of the final ascent was perfect. 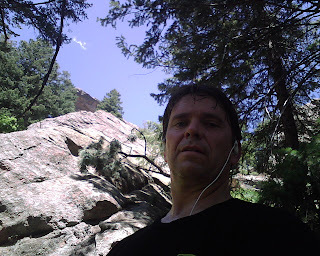 At the apex (pic 9) I talked with a guy who came up from Winfield trailhead. I made a mistake and followed him down the wrong trail for 1/2 mile. 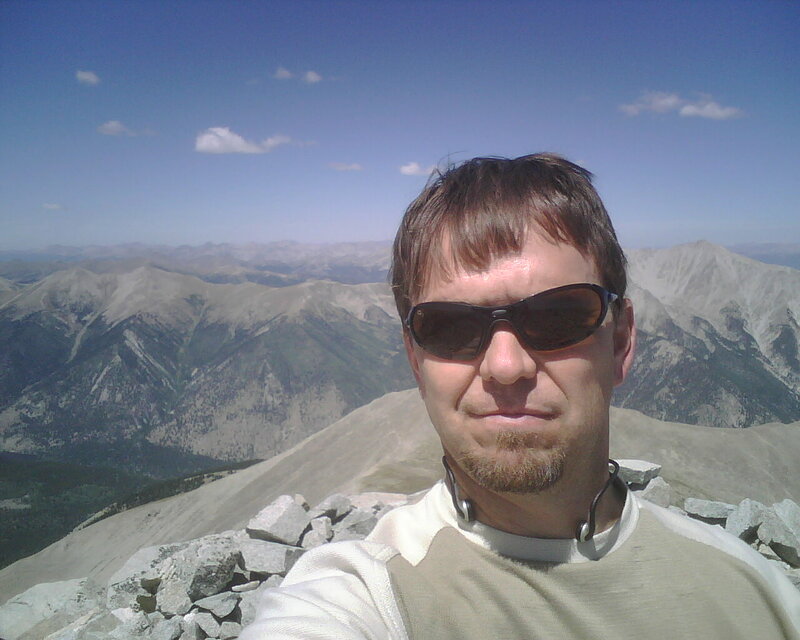 I was in a hurry to get off the top due to rolling thunderstorms and didn't realize I was on the Southwest ridge. This forced me to contour back to the Northwest trail wasting over an hour. As I was making my way slowly, the hail rolled in and my head started to crackle. I made quick progress straight down the mountain until my hair quit buzzing. I plunge stepped down a dirt hill and crossed a grassy bench until finally I was back on track. 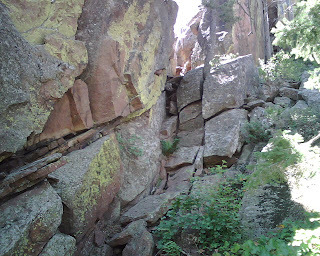 The trail here is interesting for the many switch backs. In the valley bottom I hunted mushrooms (pic 10) on the long slog back to the truck. Being a rockhound, I had anticipated climbing Mount Antero for a couple of years now. Since this 14er does not have a technical route, I kept pushing it down on my list. When peakcowboy suggested we climb it on a Thursday in September I thought it was a great idea. Any day in the mountains beats a day at work. We parked by the creek and started hiking up the road. There was quite a bit of "mining" activity on the mountain with ATVs running up and down the road. We left the road as soon as possible and tried to avoid the normal route in order to maybe get lucky and find a few semi-precious gems. I did find a few rocks with aquamarine and jade. met a guy from Virginia with Antero license plates. He discovered an aquamarine which is in the Denver Museum of Natural History. 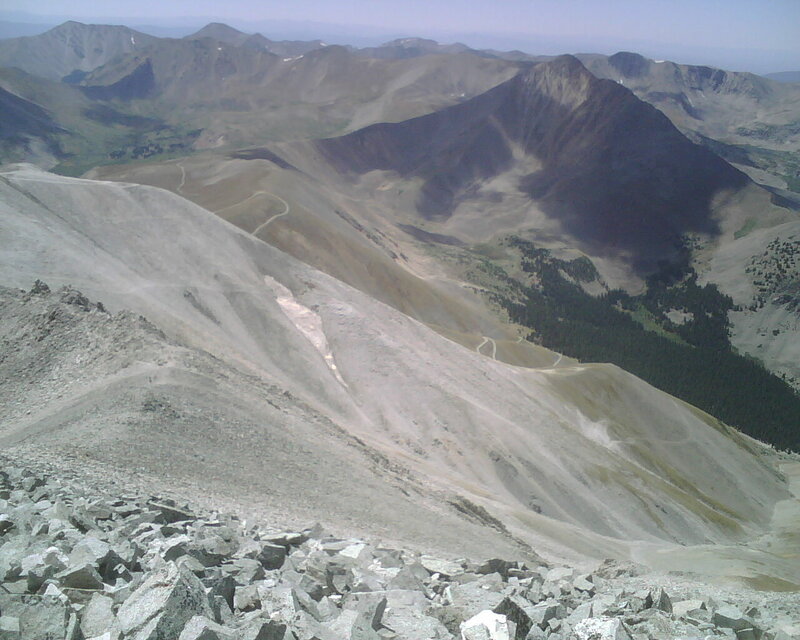 My first 14er not done on a weekend! 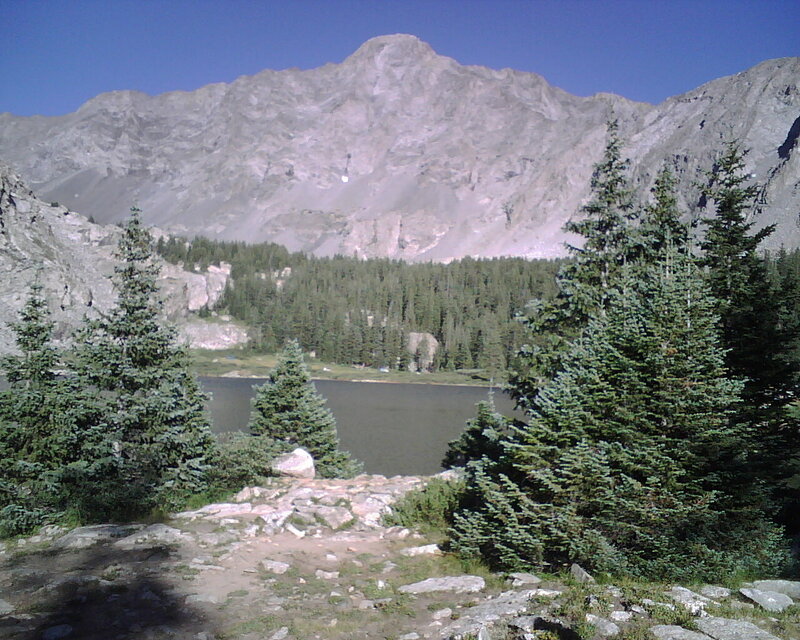 Don, Paul, and I headed out from Parker at 10 AM and hiked into huerfano basin and set up camp next to lake como. We made it two miles past the 2wd section in Paul's Jeep Grand Cherokee. We hiked the remaining road and saw an old blazer take Jaws 1 with no problems. Many camps and jeeps. We were up at 3:30 AM to start our 4:00 AM climb. We were the first up the loose gully. We kept right mostly, but very loose any way. As we made the traverse below the ridge quest we lost the trail a couple of times, but always made our way back to it. Heading up the bowling alley the climbing is a fun scramble and most definitely Class 4. There are many ropes of varying degrees of wear. 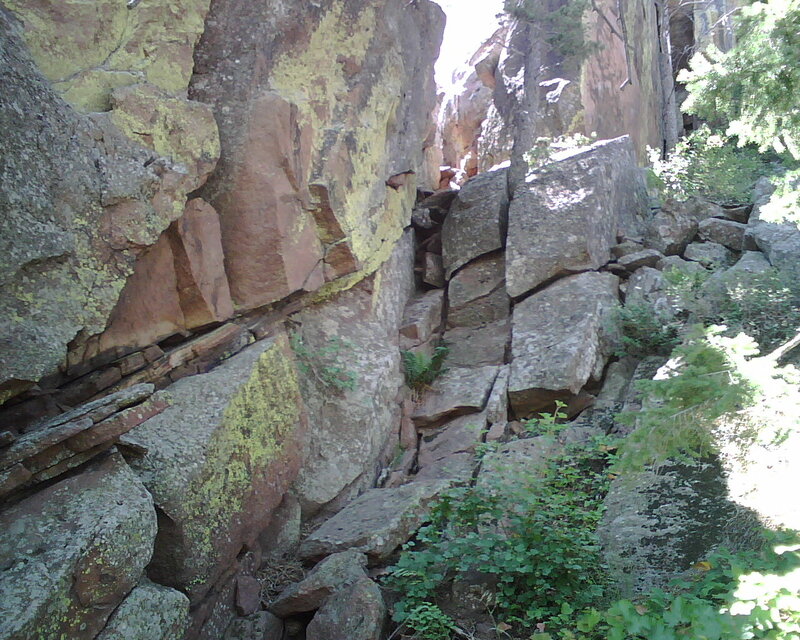 The trail then leads to the left toward the front face before making its way back to the right. There is one ledge you have to climb to follow the cairns. 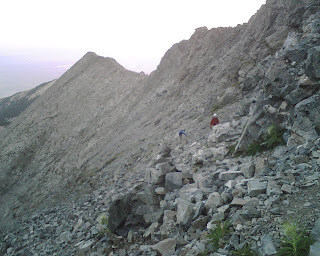 The last couple hundred feet is easier scrambling as you zig zag up to the peak. 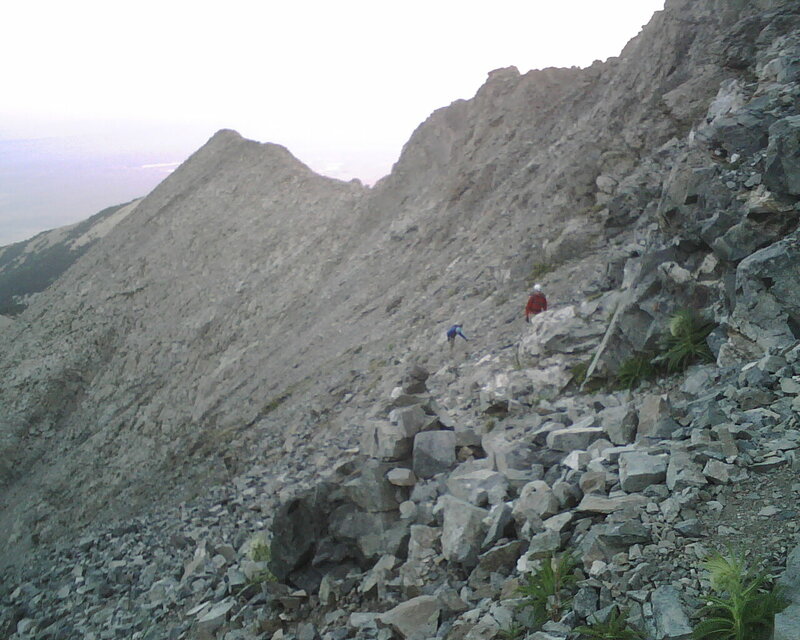 Two guys did the traverse after just beating us to the peak. We had the peak to ourselves for about ten minutes, but it was very cold. My approach shoes worked wonderfully, but I wished I had pant legs rather than just my Pira climbing shorts. On the decent we hit quite a crowd at the hour glass. Probably 10 people in three parties. I was waiting at the top of the ropes when a rock the size of bowling ball came down from the alley and flew right over my head. We could have down climbed the smooth section of the hour glass, but since we had brought our harnesses, we decided to use them. 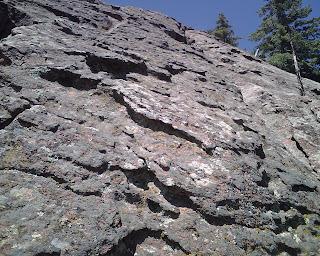 Walking down the rock on self-belay was an enjoyable way to get past this part. I seen some folks using the ropes to ascend, which I think is a bit of cheating. On the way back we again lost the trail a couple of times because there is more than one route which is cairned. Stop building more cairns please! It's not that bad really since you know the general direction you need to go anyway. Making our way back down the gully to camp was the least fun part of the route. 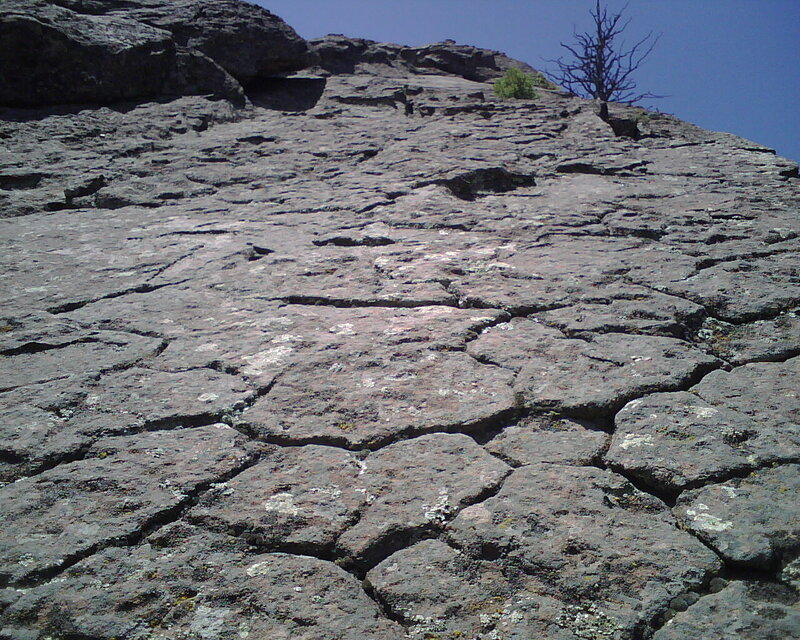 Stay to climbers right so you get some downclimb on solid rock. 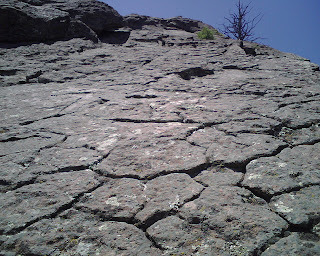 Otherwise it's a slog down loose rock and dirt that is reminiscent of Columbia's horrid descent. The hike back down the road with a full pack made for a good end to the workout. We did come across a guy trying to winch his way over Jaws 2. We offered to help, but he felt confident he could get it. 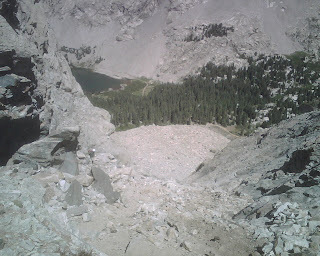 I got a good look at the traverse to Blanca and plan to do an ascent of the hand route with the Blanca traverse in 2013. Would you like to join me? The weather was great all day.